Vogue Sourcing is Manufacturer, Supplier, Exporter of Kids Bib Our Garment factory make Kids Bib in various designs, colours and sizes. Kids Bib is made as per customer's custom style and design. Our offered Kids Bib is made in high quality international standard. Best Kids Bib Manufacturers in India. 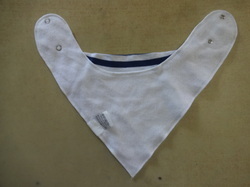 We offer variety of Cotton Neck Bibs for infants. These are finely stitched using pure cotton fabrics and are ribbed in the edges. The bibs offered by us are attached with Velcro for fixing. Furthermore, in order to cater to the global demand of our valued clients, we pack our range in different packaging material. We are engaged in offering Kids Bib and Customers can avail from us a premium range of Kids Bib. Baby bibs are used to keep the clothes of the baby clean during meal times. We offer baby bibs that are manufactured using quality fabric that is skin friendly. These can also be availed as per the specific requirements of the clients. The Infant Bibs that we are offering are best in quality and high on demand. Our products are made with soft and smooth fabrics. These products are colour fast and skin friendly. They are available in various colors and shapes. These products are available at very reasonable prices. We offer to our clients’ a comprehensive range of Kids Bib. These are a perfect blend of comfort and are designed using various patterns, prints and various color combination. These are available in various sizes with perfect finish and as per our customer expectations. - Our applique bib is just the right size for smaller bubs. It has a velcro fastening and water resistant back lining. Each colour has a different crazy character on it. 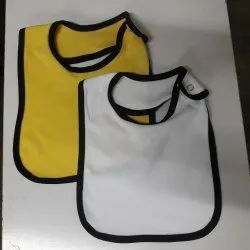 We are offering Baby Bib to our Clients.